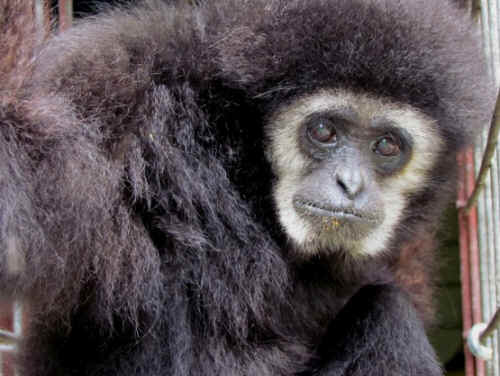 But Igor, the oldest and most popular Gibbon in residence at the International Primate Protection League (IPPL) sanctuary in Summerville has successfully made the journey -- with a little help from a lot of friends. Happily, it’s safe to say that these days Igor enjoys a superstar status few ever hope to achieve. In fact, Igor and several other older IPPL Gibbons – there are some 33 living there, many of which are over 40 and at least three over 50 -- have sparked new conversations in the primate world regarding primate lifespans, especially for gibbons. Certainly, IPPL’s sanctuary is a living testament to the benefits of a stress free life, IPPL staffers note -- and no story illuminates this quite as poignantly as Igor’s, McGreal and her staff maintain. Igor was captured, probably from the rainforests of Thailand and sold to a drug company. He would spend five years in that company’s experimental laboratories before being sold to a laboratory that was part of New York University, where he would spend another 21 miserable years. The intense stress of those experiences – the horror of being captured after poachers shot his mother and then being forced to live in a cage covered by black Plexiglas in a windowless trailer, enduring scientific experiments – took its toll. Igor developed a terrible neurotic self-mutilation behavior – he would bite his own arms savagely every time he saw another gibbon. Repeated episodes over the years seriously damaged some of the muscle and soft tissue in his arms so that even today, years after the scars healed and the behaviors ceased, his mobility is not totally what it should be, McGreal said. Nevertheless, Igor does get around pretty well and most important, he is healthy and happy. 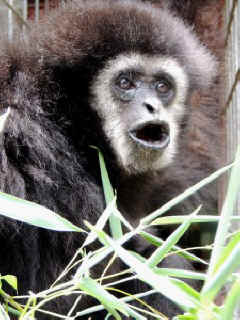 Then one day, a female gibbon named Courtney was born at the sanctuary. McGreal and her staff took the baby to Igor’s enclosure and not only did he respond positively, he didn’t bite himself at all. He seemed happy to watch Courtney grow up; she would visit for several years until she got too big and strong to be taken around the compound. 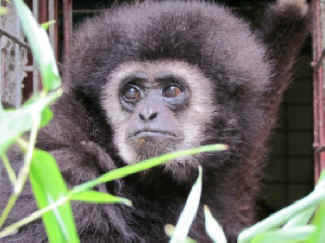 Later, IPPL built a living space for another bachelor gibbon, Michael, within clear view of Igor’s territory. Igor had no problems with visual interactions with Michael -- and now is not bothered by Gibby, another gibbon who moved into the space after Michael was matched with a female and was moved into her enclosure. Igor has become the most popular of the IPPL adoptive gibbons – adopted by more fans around the world than any of the others, McGreal said. At the recent IPPL international summit meeting held in APRIL, several of the attendees insisted on coming out to meet Igor while they were there. As recently as last week, a woman from Australia, one of many who have adopted Igor – sent a package of special fruit and nut treats to help celebrate Igor’s 25th anniversary. “He’s such a gentle soul, really special,” she said. 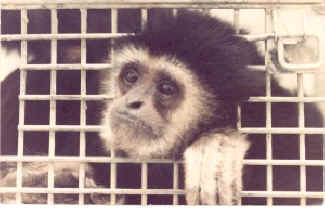 Sadly, Igor had developed a tragic, neurotic habit as a result of his years in labs: whenever he caught sight of another gibbon, he would savagely bite his own arms. Some of these bouts resulted in life-threatening blood loss. He was forced to live in a windowless trailer behind a screen of black Plexiglas. Igor has such wise and gentle eyes.